Ever wondered about how to become a bridal makeup artist? Setting up as a bridal makeup artist can turn into a nice little earner on the side or possibly even develop into a full time profession. This post is quite long so forgive me in advance, but I’ve got a fair bit to say on this subject! There are also male makeup artists out there, so don’t be put off from reading this guys! I’ve had numerous different jobs during my working life so far and have tried quite a few self-employed ventures on the side – doing bridal makeup was one of them! I ran a successful bridal makeup business for seven years. Although I’m no longer working as a Bridal Makeup Artist, this particular business is something that I can fall back on and revisit again. I don’t practice bridal makeup at the moment because since my hubby started his own business which takes him away a lot, I found I often had to pay out for childcare at the weekends. Over time, I realised I just wasn’t making enough profit for me to continue with it. But before I had my daughter, I was making a nice tidy profit for just a couple of hours work here and there. Why would anyone pay to have their wedding makeup done? 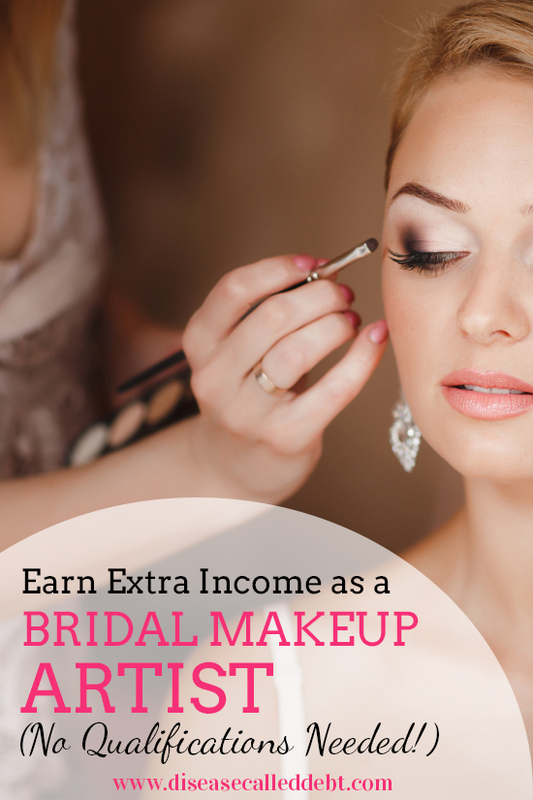 How much can you earn if you become a bridal makeup artist? You can charge between £60-£150 ($95-$240) for the bride’s wedding makeup and between £30-£100 ($40-$160) for members of the bridal party. It usually takes between 30 mins to 45 mins to apply makeup once you get the hang of it. Most brides prefer to book a trial beforehand so that they can be sure of the look they are getting for their wedding day. This of course is extra money there for the earning. Trials can be charged at anywhere from £30-£80 ($40-$125) depending on who the trial is for. Often members of the bridal party decide to have a trial as well as the bride. If you can also do wedding hair styling, then you will be able to charge more. I’m rubbish with hair so I just stuck to makeup application. The scope for how much to charge is based on the level of experience you have as a bridal makeup artist. If you’ve done many weddings and have an excellent portfolio, then you can aim to charge the higher rate. This is one of the lowest cost small businesses around. Yes, setting up this type of business does involves a small outlay, namely your makeup kit. However, compared to other small businesses, you really don’t need much money to get started. It is worth investing in a decent quality cosmetic case to house your kit, as it will add to your professional image. You may also decide to pay for training (although I didn’t do this), a website which can cost next to nothing if you design one yourself in WordPress or Blogger and you will need public liability insurance which should cost under £100 per year. When setting your fees, be mindful about ongoing expenses and how much profit you need to make for a business like this to work. Regular expenses include the cost of makeup used, fuel (unless you charge for this separately), marketing, childcare if necessary and of course your time. Unlike media makeup artists who work in film, on stage and on photo shoots, it’s actually not compulsory to gain any formal qualifications to work as a bridal makeup artist in the UK or anywhere else in the world. I can attest to this as I didn’t take any formal training and I managed to get bookings. If you wish though, you can undertake qualifications in makeup application at private beauty schools, or part or full time college courses. Regular ongoing training through workshops, seminars, reading or podcasts is useful to keep up to date with the latest developments in makeup application, however you can research what you need to know about for free online. I went down the gaining experience route. I’ve always had a passion for makeup and often used to get comments from friends about how well my eyeshadow was blended and I was frequently asked about how to apply eyeliner above the lashes smoothly and without going wrong! It wasn’t long before I started doing makeup for friends when we going on a night out and then someone asked me to do their wedding makeup. I did a few weddings for free because I enjoyed it and I started to build up a portfolio. After a while, I decided to market myself as a Professional Bridal Makeup Artist by getting myself a website, business cards and by attending local events. Brides to be looked at my portfolio and some of them booked me! After that, I got bookings through word of mouth as well as through my website. I toyed with the idea of working as media makeup artist for films and stage. But I had a full time job already and getting experience in these fields takes a lot of time and training (as the makeup application is different to bridal makeup application). Certain qualifications do need to be undertaken at least in the UK, to work in the media makeup artist industry as well as lots of practical on the job training shadowing other makeup artists. if you’re interested in working as a media makeup artist, you can read all about the job profile here. It’s a very competitive field with long irregular hours to boot. I preferred doing my own thing on the side as it fit well with my day job and life in general at that time. The main way to market yourself is to build up a portfolio. This could mean working for free to get a few weddings under your belt. You could also do makeup for friends and then take some nice shots. Word of mouth recommendations go a long way for in terms of getting bookings – every bride to be would rather know that their chosen makeup artist has done a great job for someone else first! Local wedding fayres are a good way to get your business out there in front of brides. You could offer free demonstrations and competitions on your stall to drum up interest and collect data so you can contact them later. Adding your details to wedding directories is also helpful, although I wouldn’t spend too much money on doing so. There are many free directories where you can add your business listing. 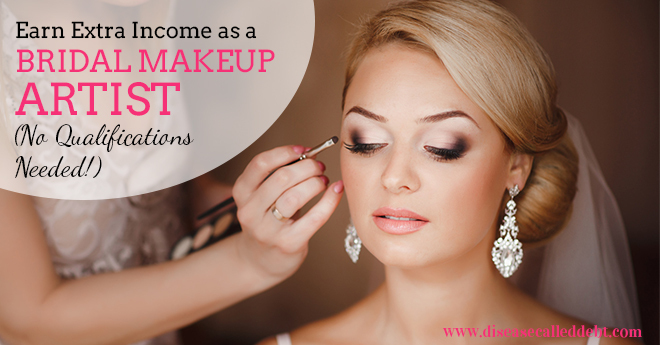 What do you really need to get started in order to become a bridal makeup artist? Some natural flair for applying makeup either on yourself or someone else. A small amount of money in order to set up in business. A basic portfolio which may mean that you will need to work for free at first. Once you’ve decided to go for it, if you can afford to set up and have taken time to build your portfolio, you could be well on the way to making a good extra income on the side or even in place of your day job! I really enjoyed my stint as a bridal makeup artist as I got to be part of so many happy couple’s wedding day. It’s really exciting being there on the morning of someone else’s wedding! Yes, there can be pressure and it’s important to get the job done properly but with practice and experience, you can be confident in your skills. Occasionally you might come across the odd Bridezilla who wants something completely different to what they agreed with at the trial and then asks for false eyelashes with 10 mins to spare! But I’ve found these experiences to be few and far between and at the end of the day, the earning potential is good and I think it’s worth it. Since writing this post originally over a year ago, I’ve been asked plenty of other questions about becoming a bridal makeup artist – including what sort of products to buy in order to build a makeup kit cost effectively and where from. So I decided to write an eBook on the subject, which will give you much more detail on all of the above. Since my blog readers are mainly from the US, UK and Canada, you’ll be pleased to know that this eBook is currently available on Amazon globally. This book is already getting tons of great reviews, I’ve included a few below and you can read all the reviews here. 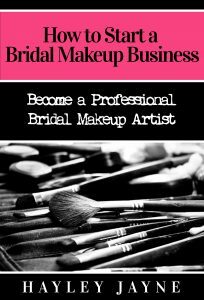 “This is an excellent resource for anyone who thinks they may want to start a service business to do bridal makeup for weddings. I found the book to be logically laid out and full of great ideas. It’s a complete guide from what you’ll need to start, to where to find supplies, to finding clients, to the business considerations. For some of the record keeping and tax requirements, this book gives the basics and you’ll probably need to do more research as you get further along. The information found here is all you’ll need to get started. Information on the skills you’ll need and how to increase your knowledge of makeup techniques and trends absolutely free. How to gain experience and put together a professional portfolio. How to create your makeup kit including what products to buy and where from in order to get you started. How to develop your range of services and how to structure your pricing. How to develop your own brand, including information on building your own website for next to no cost. Various marketing strategies to help you find clients, including how to get your website onto the first page of Google. How to expand your business by creating add-on services. Considerations you’ll need to think about such as taxes, record keeping and public liability insurance. Where to find even more resources for further reading. What’s more, you can read about all of this for just £1.86 ($2.99) – the price of a coffee! You can read this eBook instantly on your mac, PC, smart phone, tablet or other kindle device. Download today! If you liked this post, please take a moment to pin this on Pinterest and follow me for more creative ways to make money! 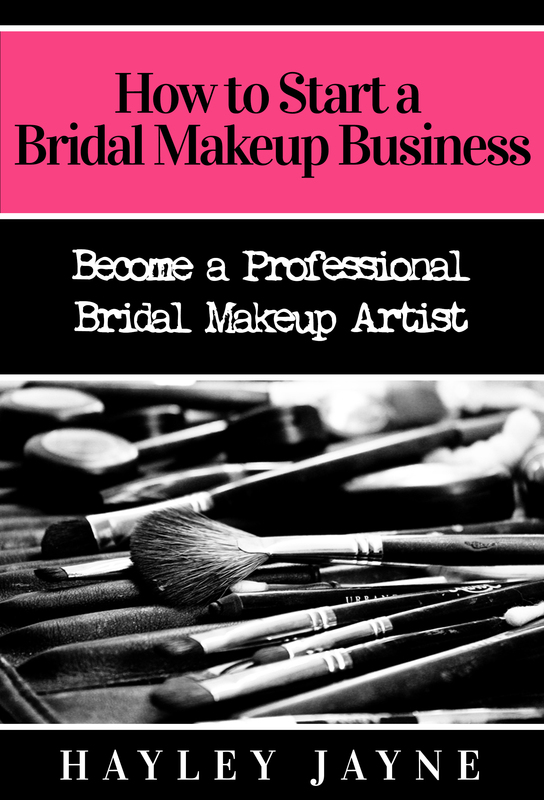 Would you like to become a bridal makeup artist? **This post contains affiliate links to Amazon. Disease Called Debt is a participant in the Amazon Services LLC Associates Program, an affiliate advertising program designed to provide a means for sites to earn advertising fees by advertising and linking to amazon.com. *Image © armina – purchased and edited under license at Fotolia (referral link). Thanks for sharing your experience! Last year, I toyed with the idea of trying to become a makeup artist, but I don’t think the timing is right. I loved to watch tutorials on YouTube and recreate looks, but I don’t have many girl friends to practice on. Have you ever thought about possibly doing videos? I know it’s time consuming, but it’s another way to make some money on the side down the road. With your prior experience, I’m sure you’d be pretty successful! There’s such a big audience for it. That’s a great idea E.M. about doing video tutorials! If I can get over my fear of being in front of the camera I will definitely give this a go – thanks so much for the suggestion! I envy people with this skill. I’ve never been good with makeup. 🙁 I think it’s a great way to earn side income! I think I’ll definitely pick it up again in the future when it’s easier for me re childcare! The photos certainly are an important part of the wedding day, so it’s nice to have make up that will look good in those! This is a really interesting idea, and a great skill to be able to monetize. I had never thought of doing bridal makeup as a side gig, but I think anything wedding-related is a great place to make extra money in. The industry has gotten so massive that there’s a huge demand for everything bridal now, and like you said you can work your way into that field just by starting with friends and people you know, and then branching out from there! Thanks so much for stopping by Laura. 🙂 Couples are spending a lot of money (on average) on their wedding day and most brides want to look and feel like a million dollars! Most wedding day make up gigs are around two hours worth of work for a pretty tidy profit especially if there are lots of bridesmaids wanting make up done too! I have no makeup skills and I will definitely be hiring someone to do my wedding makeup! Lol! It’s certainly peace of mind having someone on hand to sort this out for you on your wedding day! This sounds like a really fun way to earn extra money! I’m not so sure that I would necessarily be any good at it, but I know lots of ladies (including my own sister) who could totally do this. Dee @ Color Me Frugal recently posted…Your house is about to explode: What do you grab? It definitely can be fun, I do love weddings anyway so for me, doing make up was fab. Sometimes I received emails afterwards from brides who said how happy they were with their make up on the day – it was lovely to know that they felt good about themselves on their big day! Hi Amy thanks for reading this post and commenting! I’m really glad that you found it useful. In terms of a basic kit, you’ll need a good range of foundations, liquid and pressed powder for example. At first, I stocked just a few blushers/bronzers, lip liners, eyeliners and mascaras etc but I made sure I had a good range of eyeshadows – around 15 to start with. I then built up my kit as I went along. In my eBook, I explain how to source a range of foundations without paying out too much money and the details of which wholesalers I used. No you don’t necessarily need qualifications for bridal make up Stephanie, the portfolio is the most important thing. Out of all the brides I’ve worked with, not one of them asked about qualifications. They wanted to see my portfolio and because I had a website, I looked professional (which I was!). Good luck! Thank you for this great article! 🙂 I just downloaded your ebook and will start reading right away. I’m seriously thinking of starting my career as a bridal makeup artist but I was just wondering if E.L.F products are suitable for professional application? As a vegan, I want to use vegan and cruelty free makeup because it would make absolutely no sense at all using brands that test on animals and contain animal derived ingredients.. it would be so hypocrite! And as far as I know and researched, E.l.f is the only brand that offers that range of products, from primers to highlighters.. with wide range of eye shadows and lipstick. or do I really need to invest in professional makeup products? Super helpful blog and especially as I’ve just done my first wedding! I absolutely loved it and can’t wait to get more work but I do need to still build up my portfolio. I’m happy to do some work for free but do you have any tips on offering free services that are appealing?! Thanks Julia for stopping by and commenting! I would offer mini services for free to begin with. The last thing you want to be doing is spending a lot of time on something that you’re not charging for. How about getting together with some of your friends for a day and offering them makeovers. Make it as enjoyable as possible and get them to do their hair nicely so you can take some great photos. Finish off the day with a bottle of wine and hopefully you’ll get to add quite a few shots to your portfolio. Another thing you could try is approaching a wedding photographer and offering your make up services for engagement shoots. You do the work for free but you also get to ask for a copy of the professional pics. The happy couple taking part in the shoot will probably be over the moon at the free service so there wouldn’t be too much pressure. Hope that helps! Best of luck with your business! I am currently training to be a make up artist.but its not easy at all.I think I need a lot of practise as I hope to go into it full time. Any advice on how to start and how to break through. I am currently in Nigeria but will be coming to the UK to study in September. Hello! That was a great read and I’d really like to buy your ebook. However, as I’m from outside both the US and the UK, both links won’t allow me to purchase it 🙁 Is there any other way I could get your ebook? Thanks so much!